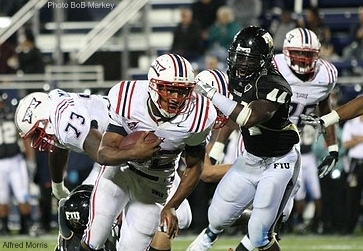 When the FAU Owls defeated the FIU Golden Panthers 57-50 in overtime in last years Shula Bowl at Dolphin Stadium, it was the best college football game I'd ever seen. FIU wide receiver T. Y. Hilton ran all over the Owls in 2008 with his explosiveness on offense and special teams. There was so much pressure on FAU to win this contest and become bowl eligible. FAU did go on and earn a trip to the Motor City Bowl and defeated Central Michigan. This year's Shula Bowl saw just one similarity from last year's contest. FAU did win by seven points 28-21. Hilton was limited Saturday Night to two kickoff returns for 51 yards and three receptions for 28 yards along with 25 yards rushing. This year's highlight was FAU back Alfred Morris (pictured), who rushed 25 times for 158 yards and two touchdowns to lead the Owls to the win. He captured the Sun Belt Conference title with 1,392 yards enabling the Owls to finish the season with a (5-7, 5-3) record. When the contest was over, Morris said the advantage of playing a December game knowing how many yards he needed, and having a chance to win the rushing title was discussed through out the week. Morris said the 2009 season was filled with a lot of learning experiences and expects to carry that over to 2010. The return of Quarterback Jeff Van Camp is something that Morris is looking forward to. Speaking of Van Camp, he rushed for 17 yards and passed for 220 yards and two touchdowns, one to Morris and the other to senior tight-end Jason Harmon, who was playing in his final game. During the week, New York Jets Head Coach Rex Ryan called his rookie quarterback Mark Sanchez a knucklehead because he brought in New York Yankees Manager Joe Girardi in to teach him how to slide feet first to avoid injuries. Van Camp doesn't expect that type of criticism from Coach Howard Schnellenberger. Even though his college career is over, Harmon said he's pleased that his final game ended with a victory. He had three receptions for 47 yards and a nine-yard touchdown. “I ended my college career on a big note,” Harmon said. “I'll never forget this game. That's a great thing! I think things were excellent for me in 2009. My knee feels great, my body feels healthy, I feel fast and everything went the way I would like. Harmon knows that fellow senior quarterback Rusty Smith is likely going to have a pro day for the scouts and he himself is looking forward to impressing some potential employers. Schnellenberger said he was pleased that when things were rough all season that the team showed character and finished just a win short of last season's 6-6 mark. Van Camp, Morris and company will have a 2010 non-conference road schedule that includes USF, Michigan State likely at Ford Field and possible BCS National Champion the University of Texas Longhorns in Austin.